If you don't have water or sewer service at your house or it's difficult just getting in and out of your house, chances are not good that you'll be successful in what may be your first job. Arkansas PROMISE project staff members knew – or learned very quickly – that teens with disabilities could need a wide range of support to participate in paid work experiences. The entire family had to be involved and sometimes basic needs had to be met first. Experiences of the PROMISE recruiters and other staff members show it's much more than a job-placement program. PROMISE reached its goal of enrolling 2,000 teens in April, more than two weeks ahead of its deadline. PROMISE is funded by a $35.7 million federal grant awarded in 2013 to the College of Education and Health Professions at the University of Arkansas and the Arkansas Department of Education. The research grant, believed to be the largest in the history of the University of Arkansas, provides paid summer work experiences for teens with disabilities who receive Supplemental Security Income. During the five years of the grant, 1,000 Arkansas teens who receive SSI will have two paid summer work experiences as well as additional training and intensive support services. The other group of 1,000 teens will receive only the usual services provided to teens with disabilities. Researchers will collect and analyze data from the two groups to help the federal government determine whether the PROMISE project should be used as a model for future programs. 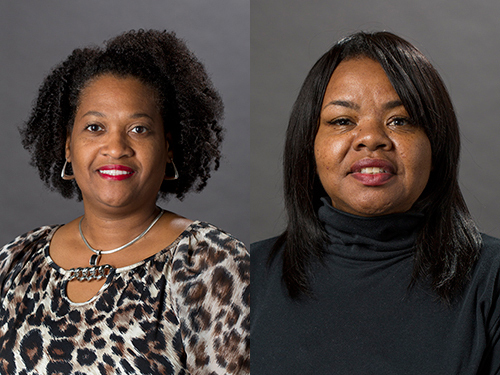 DaNita Webster and Valencia Hardy are two of the PROMISE staff responsible for recruitment. Webster led the recruiting effort over the southern part of Arkansas and also took over supervising the eastern region after a staff change last fall. "In the beginning, we got involved with the community, getting the word out there," Webster said. "We had it on the radio and in the schools. We wanted people to get used to seeing PROMISE. We started having events." Webster's events included Community Forum Ouachita County, Community Day (with recreation and vendors) Miller County, Dancing with the Stars Union County and Community Concert Columbia County. Booths were set up at each event. Resource vendors spoke to groups to let them know what they provided in each community. She did radio spots and a short television advertisement. Webster and Hardy formed a team approach during Christmas break to boost enrollment. Eligible participants were invited to the Garland County library and as a result 23 youth were enrolled. The same effort was duplicated in Jefferson County. The enrollment count in that area was 21 in one evening. Those numbers made a tremendous push to the recruitment goal. Hardy covered central Arkansas, directing recruitment efforts. She also started by attending every public, community event she could, seeking out civic organizations and neighborhood associations. She would set up a table to pass out printed information and take every opportunity to speak to groups. Hardy's events included PROMISE Neighborhoods Annual Community Forum (Pulaski County), Jefferson County Family Fun Day and Back-to-School Back-To-PROMISE enrollment event. Hardy even went to a courthouse when a truancy officer said that would be a good place to find teens and parents. She said correspondence was also mailed but it was often mistaken for junk mail. "Once we had everything ready to go in our management information system, I started directly calling people," Hardy said. "Throughout the two years, we had to take different approaches to reach such a large enrollment goal in the central region." One approach they used was for recruiters and other staff members to deliver pies from a local bakery to Pulaski County residents the week of Thanksgiving. "We formed a weekly 'Wednesday Recruitment Team,' which consisted of connectors in the central region to obtain enrollment applications," Hardy said. "This effort proved to be enormously instrumental to reaching our recruitment goal weeks ahead of schedule." She visited many homes of eligible families and recounted seeing growth of teens since she first met them. She recalled experiences with two families in which the mothers planned to get a high school equivalency diploma, in part so they could be more involved with their children's education. "PROMISE is a family," Hardy said. "You can't help the child without helping the parent. Sometimes these kids are not on the level that they know what is best for them. We are putting tools in their toolbox. "I'm glad to be a part of the PROMISE project," she continued. "We have great upcoming activities for our youth that I will actively be involved in. I am looking forward to using my skills and experience in my new duties as central region retention specialist." David Whitten, Northwest Arkansas recruiter, spent a lot of time presenting PROMISE key points throughout his region. He attended several conferences in the northwestern region. Whitten experienced great success telephoning eligible participants and home visits. He recalled several late evenings visiting with potential participants. One of his favorite parts was recruiting eligible Spanish-speaking participants and translating PROMISE information. Whitten and other staff members delivered gourmet cupcakes to Craighead County residents for Valentine's Day as another approach to obtain new enrollments and get the word out about PROMISE. Staff members employed as "connectors" were instrumental in the recruitment process, too. Connectors support the household's needs and engagement with PROMISE services and existing resources. Webster gave the example of a family in Ouachita County who lost their water service, and connector Shandi Porchia helped them get it restored, as well as finding a contractor to help with sewer services for free. The family had been without a water supply for two years. Webster also told of a Miller County participant who is a wheelchair user and lives with an elderly guardian. PROMISE connector Jennifer Harris was able to arrange to have a wheelchair-accessible ramp installed at their home so both the teen and his guardian could go in and out more easily. The family had not known what resources were available, and the PROMISE connector was able to help coordinate services. Recruiters said the primary concern parents had about PROMISE was how it would affect benefits. Would participating in PROMISE take away the Supplemental Security Income their children with disabilities received? How would it affect their monthly income? The recruiters explained that they would not lose those benefits by participating in the research project. The recruiting staff are now concentrating on retention of participants, and Alejandro Ortiz is now the state coordinator for retention, shifting from his former role as recruitment coordinator. "We will do everything that falls under the umbrella of keeping students active," Ortiz said. Brent Thomas Williams, principal investigator of the project and an associate professor of rehabilitation research and education, said supplemental funding received after the initial grant of $34.2 million made possible keeping the recruiters on as retention specialists. "We need to make sure all the participants are fully engaged," Williams said. "Otherwise, it's like we never recruited them." Webster said one reason she applied to work for PROMISE was because she likes to travel. "I have a smile on my face every day," she said. "I'm looking forward to working in retention now because, if families are not engaged, they just don't know what they are missing. I'm just the right person to get them back in stride again." PROMISE is doing what it intended, Williams said. "This is the goal of Arkansas PROMISE, to explore the best ways to help youth with disabilities receiving SSI successfully transition from high school to independence and inclusion in the community," he said.